Super Bowl 50 kicks off this Sunday between the Panthers and the Broncos (3:30PM kick off time), so here are 6 great eats and sides for game day. Stop by the Deli for easy pick up on a variety of salads, sides, and finger foods and the girls will have you covered A to Z. Recipe wise Spanky will have you covered for all your veggie needs! Check back in tomorrow for a second batch of recipes! Crispy & Crunchy, Onion rings are an easy favorite! If you're looking for some fire in your Onion Rings, try marinating the onion slices overnight in your favorite hot sauce. When ready to cook, combine flour, salt, and powder in a large bowl (Ziploc gallon bags work well too). Heat a pot or pan with a few inches of preferred oil to 360F. While heating, crack eggs into another bowl, mixing until well beaten. Dip slices into eggs, then dredge through flour mixture, tossing to coat. Shake off excess flour then fry in hot oil for about 3 minutes until golden brown. Season with salt to taste or enjoy as is. Great bean dip from our local community, highly recommend checking out a copy of the Covenant Community Church' cook book. Lots of great recipes of people around town. 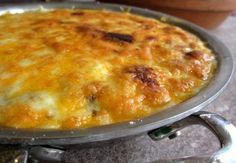 Mix together all ingredients, setting aside ½ cup of Cheese. Pour into an 8x8' baking pan and top with Cheese set aside in previous step. Serve with favorite chips and enjoy. Potato salad with a great crunch via the radishes, with a creamy rich dressing. If made ahead of time, will taste better the longer it sits in the fridge. Put potatoes in medium saucepan, covering with water by 1-2 inches. Add pinch of salt and bring to boil. Reduce heat to medium, covering partway, and cook until potatoes are tender, around 20 minutes. Drain and let cool. In a large bowl, whisk cream until thickened to yogurt consistency. Whisk in Mayo, Mustard, Lemon Zest, Lemon Juice, and Hot Sauce. Season with ¾ teaspoon Salt, and few dashes of Black Pepper. When potatoes reach room temp, cut into ¾' inch chunks and drop them into bowl with the dressing. Add the Celery, Radishes, Red Onion, Dill, and Parsley. Toss and mix to evenly distribute. Taste, adding salt and/or pepper to personal taste. Serve or cover and chill for up to one day. Freshly made Salsa is always the best and it is incredibly easy to make. In a mixing bowl, combine everything and mix well. Kabobs are a great way to put together some tasty hands on food. Does require overnight in the fridge to marinate well. Skewers, if Bamboo, soak in water for at least 30 minutes before use. Cut chicken into cubes, placing in a large bowl and season with salt & pepper. Add remaining ingredients except for the Oil and mix well. Put 5 to 6 pieces on each skewer. In a hot skillet, add two tablespoons of Oil and sear each Chicken skewer to a nice golden brown. Place them on baking sheet and finish in oven until fully cooked, around 10 to 15 minutes. In medium saute pan, lightly toast curry powder, cumin, and coriander. Add garlic, sugar, and heavy cream, and reduce by half before adding cilantro. Season with salt & pepper, transferring to a smaller bowl. Allow to cool down, setting aside or refrigerating. Fold in Greek yogurt and adjust seasoning to taste. This recipe comes together quite fast, with the marinade and spiced salt able to be made well beforehand. In dry skillet, toast spices until fragrant. Grind into a powder and mix with Sea Salt, then set aside. In blender, puree all the marinade ingredients until smooth. Pour over Chicken and allow to marinate 8 hours or overnight. Combine Rice FLour, Baking Soda, Baking Powder, and Salt in a bowl. Whisk dry ingredients into second bowl, adjust consistency with a little water or flour as needed. Be sure batter isn't too thick, and always stir before using as the batter can separate. Heat Oil in a fryer or pot to 350F. Drain Chicken from marinade and toss in extra flour. Toss in Tempura Batter, making sure to evenly coat. Season well with spiced salt, garnish with scallions if wanted, and enjoy! Hot Deli Items for Saturday & Sunday!